Middlesbrough head coach Aitor Karanka has said he does not envisage a problem with extending the loan deal for Chelsea forward Patrick Bamford beyond the 1 January expiry date. Bamford, 21, has been key to Karanka's forward line, scoring five goals in 13 games including Saturday's equaliser in the 1-1 draw at Wigan Athletic. 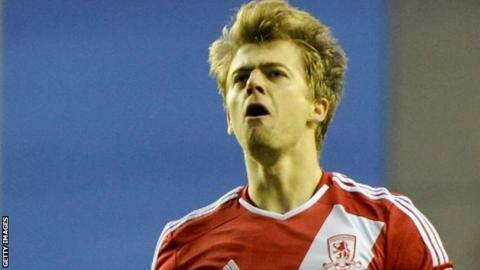 Chelsea signed Bamford from Nottingham Forest for £1.5m in 2012. "It's not a problem when all of us are happy," Karanka told BBC Tees. "For me, it's all about today, we're very happy, he's very happy here, and I'm not concerned with his future." Boro, whose coach Karanka is a former colleague of Chelsea boss Jose Mourinho, also have Bamford's team-mates Jamal Blackman and Kenneth Omeruo on loan at the Riverside. Karanka admitted he had been impressed with the forward after previous spells at MK Dons and Derby County had showcased Grantham-born Bamford's potential. "I know what kind of player he is," Karanka added. "When I brought him on loan I had no doubt he would be an important player for us. "He was with the under-21 a few weeks ago and it's an important part of his development as he trains with some great players."